It’s been a whirlwind few weeks since Donald Trump became President. Many believed (including myself) that he couldn’t win. I was wrong. Some also believed (again, including myself) that he wouldn’t make good on his campaign promises. So far, he has. And while I don’t usually like being wrong, I couldn’t be happier being wrong when it comes to President Trump’s promises to rebuild our country’s infrastructure. 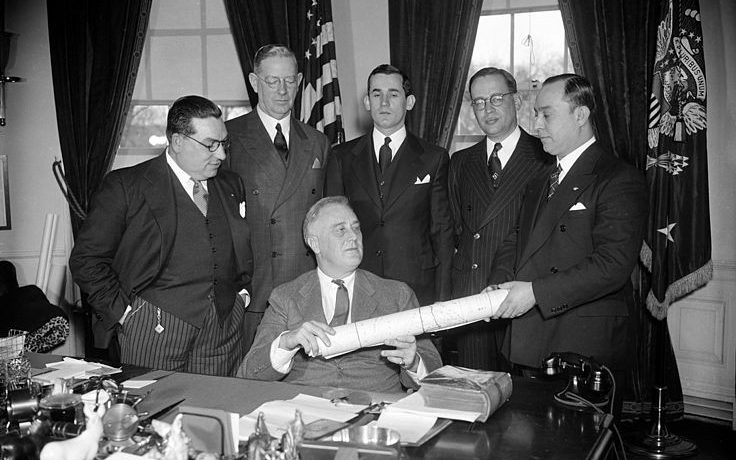 So, now that Mr. Trump is President Trump, what can the construction industry expect under a Trump presidency, which one might argue is the most exciting presidency for the construction industry since FDR? In its oft-cited infrastructure “Report Card,” the American Society of Civil Engineers gave America’s infrastructure an overall grade of D+ with an estimated investment need of $3.6 trillion by 2020 to keep the nation’s infrastructure in “good” (note, not “great”) repair. This includes the nation’s airports, which President Trump has previously said “are like from a Third World country,” vast network of roads and dams (the Oroville Dam crisis being a recent, and telling, example). The government is also broadly in agreement. According to the U.S. Environmental Protection Agency, the nation’s drinking water treatment and distribution systems need $348 billion in investments over the next 20 years. Over half of America’s public schools need to be repaired, renovated or modernized according to the U.S. Department of Education. And nearly 20 percent of the country’s roads, according to the Federal Highway Administration, are in “poor” condition. The U.S. “infrastructure gap,” as it has been called, is the culmination of decades of neglect of the nation’s infrastructure systems, many of which were built in the years following World War II during the golden era of American capitalism. These are vast, intricate and, importantly, costly systems to build and maintain. And, frankly, we don’t have a lot extra cash lying around. 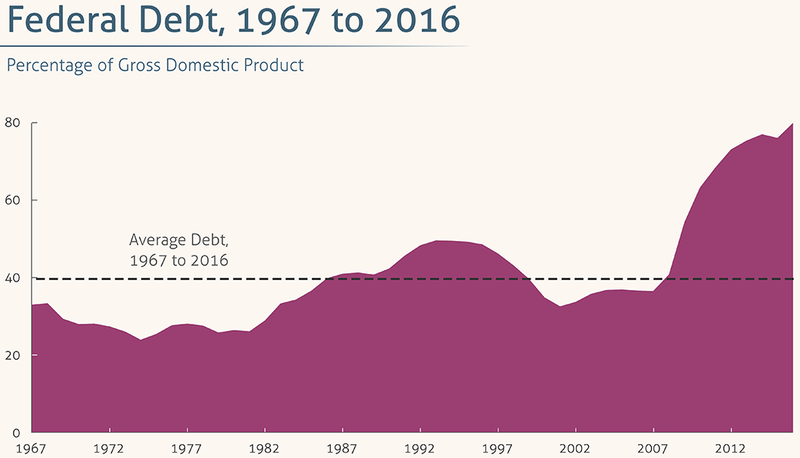 While the federal deficit has been shrinking since its high of $1.9 trillion in 2009 to $587 billion in 2016, the federal debt, which is the culmination of yearly deficits (of which there are many) and surpluses (which there are few), has reached new highs of $19.98 trillion as of 2016. Thus, while infrastructure investment enjoys broad bi-partisan support in the abstract it’s the costs involved in maintaining and improving the nation’s infrastructure where political willpower lacks. 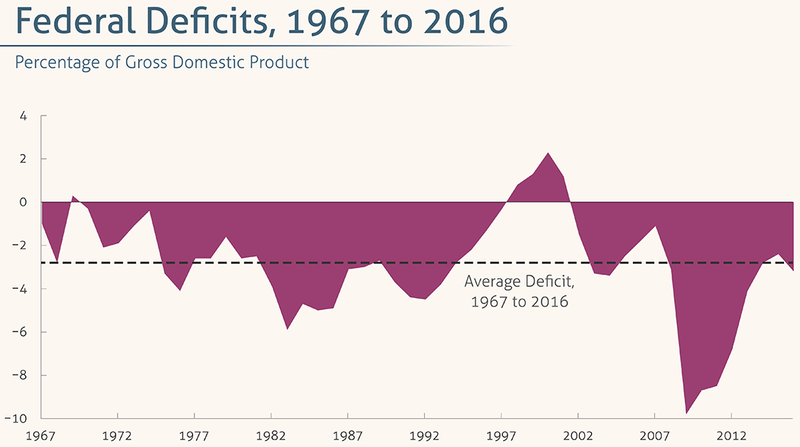 Hence, for example, the federal excise tax (i.e., “gas tax”) of 18.4 cents per gallon for gasoline and 24.4 cents per gallon for diesel, which funds road maintenance and improvements, has not seen an increase since 1993! On the campaign trail, Hilary Clinton proposed a five-year, $275 billion infrastructure spending plan. In response, Trump promised to “at least double” Clinton’s proposed plan, and late in his campaign promised to spend at least $1 trillion (although his campaign website said $550 billion or more) on improving the nation’s infrastructure through infrastructure bonds. While it’s unclear what Trump’s infrastructure plan will ultimately look like, what is clear, is that his administration can’t do it without congressional approval – which, on one hand, might not be too difficult with Republican majorities in both houses, but on the other hand, between the two major parties, Democrats rather than Republicans have been the traditional torch bearers for infrastructure spending. Tax Credits and Public-Private Partnerships: Trump’s economic advisors during his campaign – billionaire Wilbur Ross, who he has nominated as Secretary of Commerce, and economics professor Peter Navarro, who he has selected as Director of his newly created National Trade Council – have suggested a $137 billion federal tax credit to private companies that finance infrastructure projects, which they say would unlock $1 trillion in infrastructure investments over a span of 10 years, all at no cost to taxpayers. Repatriation: Stephen Moore, a writer and political analyst, and tax advisor to Trump during his campaign, has pushed the idea of using monies received from a 10% overseas repatriation tax holiday to help fund infrastructure projects, although the proposal would likely raise only $150 billion over ten years. Reduced Regulations: Elaine Chao, President Trump’s Secretary of Transportation, and spouse of Senate Majority Leader Mitch McConnell (R-KY), said during her confirmation hearing that the Trump administration would streamline regulations to get projects off (or, one might say, “on”) the ground, which was one of the complaints with President Obama’s American Recovery and Reinvestment Act of 2009. She also said that direct federal investment in infrastructure is not off the table. Buy and Hire American: While not limited to infrastructure spending, President Trump has previously stated, “My administration will follow two simple rules: Buy American and hire American.” While it’s unclear whether this is a reaffirmation or an expansion of “Buy America” contract provisions, whereby preferences are given to companies who use American-made products, Republicans have generally been against such provisions. Senate Democrats, in what appears to be in part an effort to drive a wedge between President Trump and congressional Republicans, have unveiled their own $1 trillion infrastructure plan and have urged President Trump to work with them. The plan, entitled “A Blueprint to Rebuild America’s Infrastructure and Create 15 Million Jobs” (how can you be against that? ), relies heavily on direct federal investment. First, let’s be clear: While Trump’s “infrastructure plan” has been bandied about, there currently is no infrastructure plan, or at least not a publicly disclosed one. President Trump has “promised” to spend at least $1 trillion on infrastructure. His “plan” on how he’s going to make that happen has not yet been unveiled. A $1 Trillion Plan Won’t Pass Congress: A threshold question is whether congressional Republicans are even willing to pass a $1 trillion infrastructure plan. Senate Majority Leader Mitch McConnell has already stated that he wants to avoid a “trillion-dollar stimulus” to fund infrastructure and House Speaker Paul Ryan has indicated that there are other more important agenda items ahead of infrastructure, including repeal of Obamacare. Tax Credits Won’t Work: First, a clarification: Tax credits do work. Much of the nation’s affordable housing was built using tax credits. The issue here, though, is whether tax credits can spur private investment into infrastructure projects rather than affordable housing. Some say it won’t. Infrastructure projects, they argue, are extremely costly. As such, only large pension funds and investment funds controlled by other governments would have the financial wherewithal to invest in such projects. But those pension funds and investment funds don’t pay taxes. And if they don’t pay taxes, tax credits aren’t much of an incentive. Public-Private Partnerships Won’t Work: Again, a clarification: Public-Private Partnerships (aka, PPPs) can work, and there are examples of successful PPP projects throughout the world. The issue is whether PPPs can be successful used for the types of infrastructure projects our nation needs. For a PPP project to be successful there must be a sufficient economic incentive for private equity to invest in the public project. Toll roads are a good example. There have been successful PPP toll road projects where a private developer (the concessionaire), in exchange for all or a portion of tolls received, will invest in such projects. However, while toll roads may be economically viable from a concessionaire’s standpoint in heavily populated urban areas, they may not be so in more rural areas, leading to uneven infrastructure investment. In addition, because there must be an economic incentive for private equity to invest in public projects, some have argued that for other infrastructure projects, such as dams and water treatment plans, the only economic incentive would be use taxes on consumers, which are politically unfavorable, as the gas tax has shown. Finally, in today’s low interest rate market, it is relatively inexpensive to borrow capital, making it more likely that private developers would want to build more profitable, less risk-sensitive private projects than public ones. We’ve Never Done Something This Big Before: That’s not to say that simply because we haven’t done something this big before means we shouldn’t do it, but when there are multiple pieces to coordinate it takes more than just force of will to get it done. Not only do you need the primary players, but we may need to create new security instruments through which investors can invest in such projects. Insurance companies may need to create new insurance products to cover such projects. And, because I’m a construction attorney, there needs to be mechanisms by which the government can ensure that such projects get completed and contractors, subcontractors, material suppliers and equipment lessors are assured they will get paid. And with respect to “the Wall,” which I’m sure you’re all wondering about in the context of this discussion, all I can say is that it’s supposed to be “big” and “beautiful.” We will see. A major question for the new administration is use and encouragement of project labor agreements. A tieter toter issue that sways as each party takes control. Trump has still not acted to repeal Obama’s EO13502. But as of yet, no action.